One of the best things about the fall season is the delicious scents that come with it, like cinnamon, clove, ginger, and nutmeg. They are all rich, warm, and inviting, making them the perfect scents to wrap yourself up in. Fall also brings cool weather which can be drying to your skin, but you can combat it with ingredients that soften and condition. It is even better when you can combine those two into one great product that you can keep for yourself or gift to friends and family to get them into the fall spirit as well. 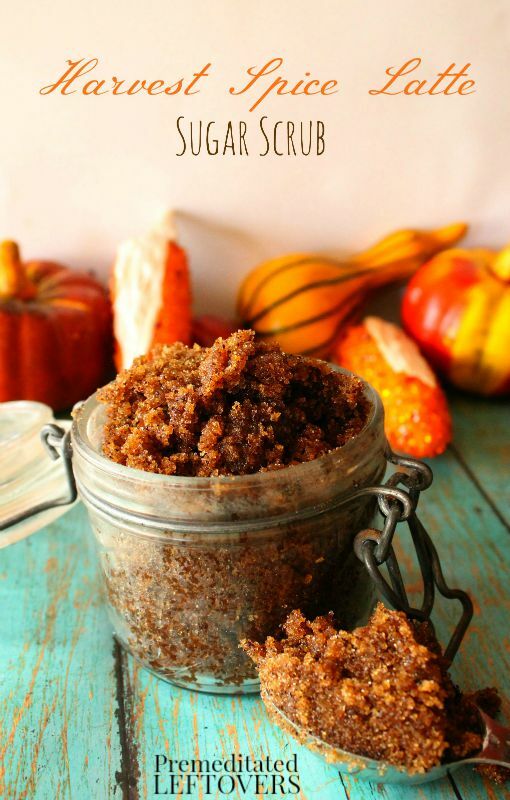 This Harvest Spice Latte Sugar Scrub is the ideal way to wash away dry, dull skin. Maybe coffee isn't necessarily a fall scent, but it definitely wakes you up and gives you and your skin a jolt! Apply a generous amount of the sugar scrub to damp skin and rub it in gently. Apply a bit more pressure on tougher areas like feet and elbows. Rinse well, and pat your body dry. The vitamin E in this recipe acts as a natural preservative and your scrub should be shelf stable and last for about a month. Keep it refrigerated and you can double the shelf life. When you say coffee grounds do you mean dry ground coffee or the wet grounds after you’ve made a pot of coffee? Sorry if this is a silly question but I’ve never made a sugar scrub before. Thanks! Do you have any trouble with the coffee grounds going down the drain?